Upon returning home from work to find my home in its usual disastrous state, my heart sank. As is her usual ritual when I get home, my toddler was tugging at my hand to play and I was left reeling about how my house would ever actually get cleaned! Then it hit me, my 18 month old loved helping mommy around the house, and I would be able to get a few tasks accomplished before starting dinner while she worked on her toddler chores. Raising a toddler is fun (and exhausting), but watching them learn new things, like how to help mommy around the house, is awesome! Here are six ways my toddler helps me around the house, and enjoys it! 1. Putting her toys away. 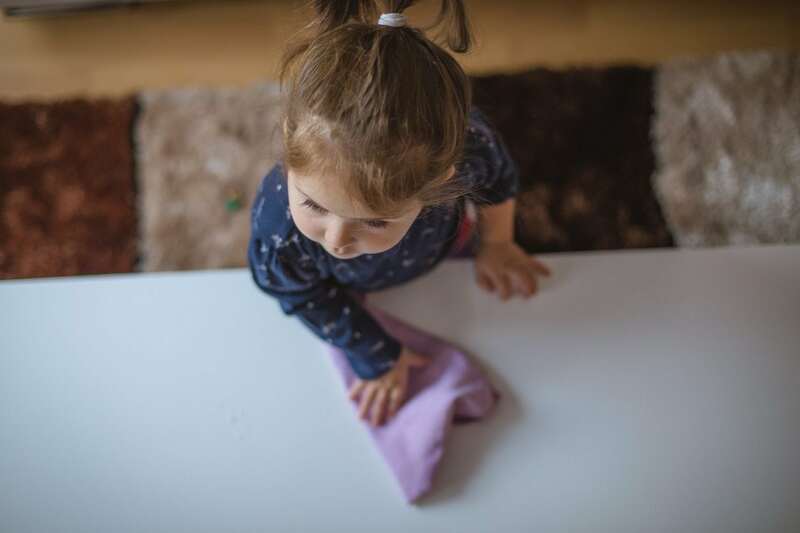 This toddler chore is perhaps the easiest (for her) and most helpful thing she does around our home. With her plethora of toys, that seems to multiply every day, it’s great to have that extra set of hands! 2. Giving the dog and cat their treats. This particular toddler chore is by far my daughter’s favorite! She absolutely loves our pets, and I love that she is learning to be gentle and kind to animals. My toddler really looks forward to “treat time” and even though our spoiled pets get far more treats than they deserve, it’s one less job I have to do, and that makes this mama a happy camper. 3. Putting her laundry away! 4. Getting her diaper and wipes. This one is perhaps my favorite thing that she helps me with. Even at 18 months old, it feels like I’m still changing her every five minutes! I love that she can go to her basket and bring the goods to me. Mommy win! 5. Picking her shoes for the day. Keeping her basket of shoes on the lowest shelf in her room may be one of the smartest things I have ever done. She loves picking her shoes for the day, and usually picks two of the same shoe! This is one step towards getting herself dressed, and I only have to switch flip flops for snow boots occasionally. Now if she could only put them on by herself . .
6. Throwing items away for me. This is literally the reason I had a child. Joking! But seriously, this job is never ending! Between scraps of paper that magically appear, to her tissues (hello, cold season) there is always something to toss. I’m just hoping I don’t find anymore shoes or cash in the can. All in all I’m blessed to have a little helper! I love that my toddler is learning responsibility, and how to help and pitch in around her home. It makes all the jobs I have to accomplish everyday so much more pleasant. Taking care of a home can feel very mundane, and it can become quite a burden for moms to find the time and energy, (thank you coffee) to get it all done. Any helping hand is welcome, even when it’s my toddlers tiny, baby hands. I love how excited she gets, and how proud she feels when we finish a task. Any time lost on tasks is worth it to see my daughter so happy, just to be helping mommy.